When dealing with chronic fatigue that is often associated with fibromyalgia, patients face a number of difficult decisions when it comes to the type of medication they take. SSRIs may be used more frequently, but is 5-HTP better for you physiologically? If you find yourself in chronic pain, feel fatigued no matter how many hours of sleep that you get and that everyone is complaining you are constantly irritated, just know that there may be a medical condition at play that could be causing all your grief. Fibromyalgia is a disease of many faces in presentation and physicians are baffled at the underlying mechanism that causes it. It is a disease that can affect nearly 20 percent of patients and is more likely in patients with autoimmune disorders . Many treatment options exist, and all are designed to improve symptoms associated with fibromyalgia; namely fatigue, low-tolerance for pain and mood changes . Supplements for fibromyalgia play an essential role in improving treatment results and allowing patients to return to their normal life . Supplements are effective in fibromyalgia pain relief, but in this article, I will highlight the "fatigue" aspect of fibromyalgia and why you should consider 5-HTP for better sleep. Although you may not know what the acronym stands for, 5-hydroxytryptophan (5-HTP) is the immediate precursor for serotonin (something you probably have heard of.) It is an effective supplement that can help manage a patient's energy levels and depression, but there are some things to know beforehand to make sure you are taking this medication safely. This supplement for fibromyalgia is now available on an "over-the-counter" basis . Another thing to be mindful of when you consider introducing 5-HTP into your system is that it is much more potent than traditional serotonin because it has a more systemic effect on an organism. This compound can cross the "blood-brain-barrier" a natural layer of protection for our brain so potentially harmful chemicals cannot reach the brain . Our 5-HTP compound holds its shape before crossing the barrier while serotonin is unable to pass. Because of this free passage, 5-HTP can affect you much more powerfully than a serotonin pill by itself. As a reference, alcohol is another compound that can freely pass through the blood-brain-barrier, and we all know the repercussions of too much alcohol. As you can see, this compound is not a recommendation from a physician when it comes to major depression, but in most cases of fibromyalgia, patients do not have a major depressive disorder. They have dysthymia instead, which is a term used to describe patients who have a "mild" depression for at least two years of time. You may not necessarily be suicidal but you feel sad, without energy, and have occasional problems sleeping . 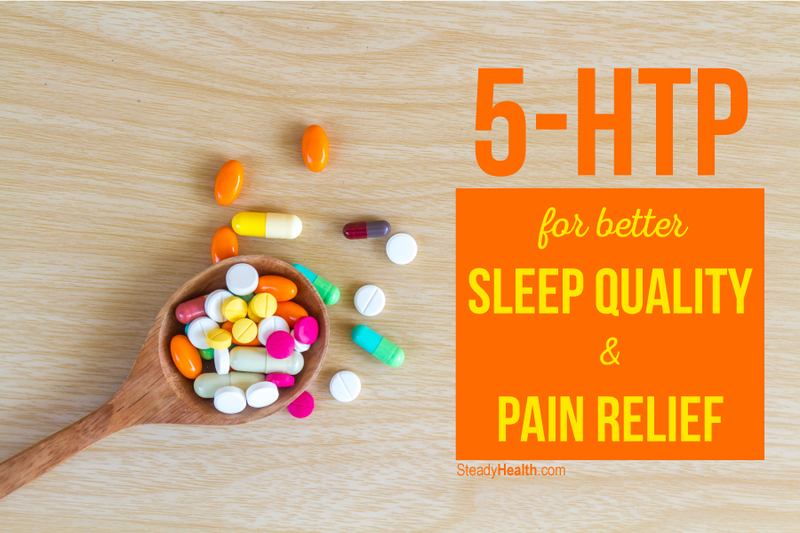 This is where we can find that 5-HTP for better sleep may be possible. In one study, 5-HTP was challenged against tryptophan to see what compound helped patients sleep better. If the name tryptophan sounds familiar but you can't quite place where you've heard it before, think of the post-Thanksgiving dinner coma that your body goes into after eating a lot of turkey. At the conclusion of the study, it was determined that both 5-HTP and tryptophan alleviated symptoms of "mild" depression in patients compared to the controls . Although researchers stated that larger sample sizes would have been better to make more sweeping conclusions, they felt that the analysis demonstrated that 5-HTP was a viable option even by itself to treat dysthymia. If patients can sleep more easily, the aim of the treatment is to try to restore restorative sleep to have the patient feeling normal once again.